BC Cowboy Hall of Fame nomination deadline is quickly approaching on November 1st. Do you know someone you would like to nominate to be inducted into the BC Cowboy Hall of Fame? Information and forms can be found on the BC Cowboy Heritage Society website or forms are available for pick up at the Museum of the Cariboo Chilcotin. 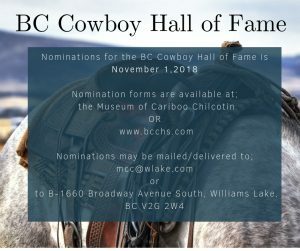 Any two people can nominate a cowboy for the BC Cowboy Hall of Fame. Just fill out the nomination form, print it, and send it in with a biography of the nominee (birth place, family, work history); list of accomplishments; reasons why the nominee merits induction into the BC Cowboy Hall of Fame; and a Photo(s) (copies are accepted with an application, but originals should be available if the nominee is accepted). The deadline for nominations, for the year, is November 1st.